K9 Unit Supervisor, Sgt. Thomas was promoted to the rank of Lt. and reassigned to the newly formed UPD Taylorsville precinct. K9 Quinto was retired to the care of Lt. Thomas. 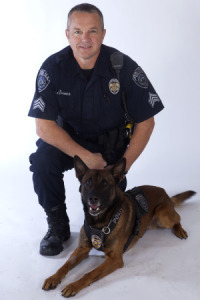 "Being the Supervisor over the UPD K9 Unit was the most rewarding experience of my law enforcement career. I got to work along side a great group of professional K9 handlers not only within the UPD but throughout the state of Utah. I am excited to see the K9 Unit progress under the leadership of Sgt. Chad Reyes. I will do everything I can to continue support of the K9 Unit and will remain the President of the non-profit "Friends for UPD K9". Thank you all for your support"